The​ first round is​ a weird​ time​ to​ be​ a fan​ of a non-playoff​ team. On the one​ hand, it’s like​ being​ the kid who’s​​ sick at home, watching with your nose pressed up against your bedroom window while everyone else frolics outside. On the other hand, sometimes the playoffs are more fun when you don’t have a rooting interest, or at least less stressful. And more importantly, as all those playoff teams get eliminated, their fans get to be sad too. Welcome to the pity party, losers. Therefore, I can understand if you non-playoff fans have some mixed feelings these days. But today, let’s try to tilt the scale to the bright side. Let’s go through all 15 teams that didn’t make the postseason and come up with at least three positive thoughts as we head into the offseason. And since that will admittedly be more difficult for some teams than others, we’ll work our way down from the easiest to the most challenging case. The negative: Despite plenty of young talent, they missed the playoffs yet again and still haven’t won a single playoff round since 1996. Positive thought No. 1: All that young talent is still there and most of it should still be getting better. Sasha Barkov is still just 23 and is already considered one of the league’s elite young players (not to mention among the very best cap values). Mix in a breakout year from Jonathan Huberdeau and some of the pieces are already in place. Positive thought No. 2: They just hired one of the best coaches ever in Joel Quenneville. Will all due respect to Bob Boughner, that should be a massive upgrade behind the bench. Positive thought No. 3: They’ve made it clear that they’re going to spend a ton in the offseason, which we all assume includes signing two-time Vezina winner Sergei Bobrovsky. Goaltending sunk them this year, so adding a star there changes the team’s entire outlook even if they don’t make any other moves. See? Optimism is easy. Granted, the Panthers are the tutorial level. Let’s up the difficulty just a bit. The negative: The Coyotes missed the playoffs for the seventh straight year, the longest streak in a Western Conference where only one other team has missed for more than two. Positive thought No. 1: The Coyotes finished the year with more wins than they’ve had since their last trip to the postseason. They won ten more games and had 16 more points than last year, so there was very clear progress. That obviously doesn’t guarantee anything, but it’s better than the alternative. Positive thought No. 2: That progress came despite a season marred by plenty of injuries to key players. That included their starting goalie, a loss that would have derailed most teams. Every team has injuries, but give the Coyotes slightly better luck in the health department and they make the playoffs. And even with all those injuries, they still won more games than the Avalanche, who are already on to the second round. Positive thought No. 3: Speaking of goaltending, the Coyotes head into 2019-20 with two potential starters in Antti Raanta and Darcy Kuemper, which is two more than some of the other teams on this list have. That could lock down an important position, or it could open the door to a trade. Either way, the Coyotes are in solid shape heading into next season and most of us probably already have them penciled into the playoff race. The negative: You know how sometimes you think a team will be bad and even they seem to think they’ll be bad, but then miraculously they’re actually really good? That happened to a New York team this year, but it wasn’t the Rangers. Positive thought No. 1: It’s a rebuild. Jeff Gorton has made that clear. This season had its ups and downs, but it was basically all part of the plan. If anything, they won a few more than most of us expected. Positive thought No. 2: They won the lottery and will pick second, meaning they’ll almost certainly get a blue-chip prospect in Jack Hughes or (more likely) Kaapo Kakko. They overachieved expectations and still got a potential franchise player. It was the best of both worlds. Positive thought No. 3: In addition to their own pick, they also have Winnipeg’s first and Tampa’s second. And don’t look now, but they might still get the Stars’ first too, if Dallas makes it to the third round. The negative: They came into the season’s final week in good shape to snag a wild card, but stumbled and missed the playoffs. That makes this just the second time since the 1920s that they’ve missed in consecutive years. Wait, that’s can’t be right. Positive thought No. 1: They missed the playoffs by two points in a year when just about everyone thought they’d be terrible. And they did it while racking up more points than three Western playoff teams. That might be a sign that the format is unfair, but it reinforces how strong a season Montreal just had. Positive thought No. 2: Goaltending is crucial for every team, but when you’re paying your starter a league-high $10.5 million against the cap, you absolutely have to be getting All-Star level play out of the position. In recent years, Carey Price hadn’t always provided that. But this year, the old Price was back. Wait, Habs fans probably want us to avoid the word “old” here. Positive thought No. 3: Remember when everyone thought Marc Bergevin was a terrible GM who’d surely be fired any day now? You should since it was less than a year ago. But this year’s moves largely worked out and Bergevin’s reputation has at least been given a polish. That’s good news for Habs fans, seeing as how Geoff Molson has apparently decided that Bergevin will be around forever. OK, this hasn’t been too bad, but I’m pretty sure that’s the last 96-point team we’re going to find on our list. Let’s bear down and think positive. The​ 2019 NHL playoffs​ are​ chaos. On​ that,​ we​ can​ all agree.​ The argument comes​ with the second​ half​ of the equation,​​ which we’ll get to in a minute. But chaos? Honestly, that might be underselling it. As far as things playing out as expected, we’ve got the Maple Leafs and Bruins going to Game 7, which we all figured was coming. The Capitals are in good position to beat the Hurricanes, although it’s been a tougher battle that most one-versus-wildcard matchups. The Islanders were technically the favorite over the Penguins, although nobody saw that one ending in four. Beyond that? Madness. The first round has been a steady stream of upset exits, ranging from mildly surprising (Jets) to shocking (maybe the Predators Monday) to stunning (Flames) to incomprehensible (Lightning). Both top seeds are out, and it’s possible that all four division winners could be done in Round 1. The Islanders might be the only home-ice team to make it out alive. I don’t know what your bracket looks like, but I know it’s busted, and I wouldn’t be shocked if more than a few of you are staring down the possibility of an oh-for-eight. That should be pretty close to impossible, but here we are. Nothing makes sense, nobody knows what’s going on, and none of us have the slightest clue what’s going to happen next. It’s chaos. We all agree. Here’s the part where the argument starts: Is all this chaos a good thing? I’ve asked that question in a few places, and something very strange happens whenever I do. Take this tweet, which quotes from a post I wrote a few weeks ago and then adds what seems like a reasonably lukewarm take: “I’m not sure this kind of Tampa upset is really a good thing for the NHL.” I tweeted that a week ago, and lots of people called me an idiot. That’s not strange – it’s Twitter, you can’t say anything without getting called an idiot. But the reaction was split almost exactly down the middle, with half of the people in the “Can you believe this idiot?” camp and half on the “Yep, this is how I feel too” side of the fence. Here’s the strange part: More than a few fans on both sides didn’t seem to understand why the point even needed to be made. It was either the dumbest thing they’d ever heard, or the most obvious. There were all these hockey fans, just about evenly divided, who didn’t even seem to be aware that the other side of the debate even existed. It was Yanny vs. Laurel for the NHL playoff crowd. It’s weird. Even when hockey fans get really mad over replay review or suspensions or fighting or whatever else, they tend to at least be aware that there’s another side. Not here. All of these upsets are obviously a good thing. Or they’re very obviously not. Why are we even talking about this? I think I’ve figured out what’s going on. Picture yourself standing in front of two doors. It’s Day 1 of the playoffs, when everything is still all shiny and new and nobody’s brackets are busted yet. You’re about to settle in for two months of NHL postseason action. But first, you have to decide which door you want to go through. You’re probably going to pick the same door you pick every year. You’re probably so used to picking that door that you don’t even realize the other one is there. But which door you pick ends up deciding a lot about how you view the playoffs, and whether you’re enjoying this year’s edition. The first door stars with a belief, and it goes like this: The best team always wins the Stanley Cup. It’s not the team with the best regular season record, because while the regular season tells us something, it’s not enough. It’s not the team with the biggest stars, or even the most talent top-to-bottom. It’s not the team with the best special teams or the smartest coach or the loudest fans or even the hottest goaltender, because while all of that certainly helps, it can only take you so far. And that’s what it’s all about: How far you can go. One team goes all the way, while the other fifteen go home. When it’s over, one team is left standing, and that team is the best. They always were, even if we didn’t realize it until the very end. In essence, if you choose door No. 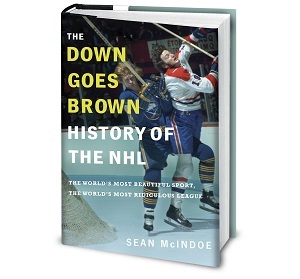 1, you view the Stanley Cup playoffs as a two-month tournament designed to reveal the identity of the best team. The system can be ruthlessly efficient, discarding some teams almost immediately. It can also tease us with fakes and misdirection, baiting us into thinking we’ve figured out the identity of the best team, only to have the case dramatically collapse, leaving some other team as the new favorite. But the key point is that the best team always wins. The occasional controversy aside, the system has a pretty much perfect success rate. It’s brutal and exhausting for everyone involved, but it works, and in the end the best team is left standing. They win because they’re the best. They’re the best because they won.